“The Sk2 has now become my “single keyboard”. I used to have to take two boards to cover a gig. The new voices in the Sk2 exceeded my expectations. The pianos can be bright enough to cut through a rock and roll band, while the electric pianos remain fat and punchy for R&B. The extra voices cover what I need and I can’t wait to go to the internet to explore even more. Of course, the Hammond screams! But I always had to drag along something else to do those extra parts. No more. Now I pull up a patch that has exactly what I need on both manuals, sometimes extras on top, sometimes on the bottom, sometimes just two glorious Hammond voices – without a bunch of connecting cables and routing voodoo. Now I have my full keyboard arsenal in a bag on my back, I can make that grand entrance like the guitar players! WooHoo! Thanks for turning me on to the new revolution in keyboards. We thought about calling this the “Have Your Cake And Eat It, Too” but that would look silly on the back. We agreed on calling it the HAMMOND Sk2 and when you play it you’ll see that first name is indeed appropriate. For many years, HAMMOND has been asked to make a truly portable double 61 note instrument that didn’t share the gross weight of a Refrigerator. The Sk2 can do it all. HAMMOND Drawbar voices up top, Grand Piano on the bottom-or vice versa. Manual Bass and Organ comp on the bottom, Horn section up top for accents. And yes, you can play the Sk2 as a double manual HAMMOND Organ in the traditional fashion, the Pipe Organ voices, too. Add one of our optional pedalboards, and you’ll have the pro rig you’ve always dreamed of, but didn’t have the roadies or van to realize. “All the great Extravoices and Organ Voices you have heard on the other Sk Pages live inside the Sk2, of course. And, you can tailor your Sk to be any Hammond Organ you desire, though the extensive customization capabilities. Here are a few unique examples from the personal files of our Artists”. COMBINE THE HAMMOND ORGAN OF YOUR CHOICE WITH THE LESLIE OF YOUR CHOICE TO COMPLETE YOUR DREAM RIG! Laurens Hammond’s original Organ (invented in 1935) had an intricate electro-mechanical mechanism that used 96 Quarter-sized wheels spinning on driveshafts powered by his patented synchronous motor. The wheels were notched according to pitch, and an electromagnetic pickup (much like that on an Electric Guitar) sensed those notches and rendered a musical note. The Drawbars combined those harmonic tones to produce the inimitable Hammond Organ sound. The Modern Hammond Organ’s Sk Series’ VASE III “Engine” uses the exact model of Laurens Hammond’s design, executing it in the digital realm, with no moving parts, retaining all of the nuances, imperfections and idiosyncrasies of the original. The wheels are always “spinning”. When a note is played, the tones pass, just as water through a faucet. The random starts of each wave played allow for phase interaction, producing the rich tone so prized in the vintage Hammonds. The Digital realization of Laurens Hammond’s System allows sophisticated control of every facet. Each Digital Tonewheel can be voiced for Volume, Timbre, Motor Noise and Leakage; enabling the musician to tailor the Modern Hammond to match the characteristics of any Vintage Hammond, or to create their own vision. Twelve Macro Profiles allow the user to quickly select the most popular “kinds” of Hammond, from Showroom-New to Road-Worn Antique and all points between. At our website, You may now download and install custom Tonewheel sets provided by some of our Artists, as well as other vintage Hammond Organs as cloned by our in-house expert staff. The Tonewheel Generator wasn’t the only great invention of Laurens Hammond, and no Hammond Organ would be complete without the full spectrum of ingredients that comprised Mr. Hammond’s genius design. Mr. Hammond used the Pipe Organ Design concept of “Unification” in creating the iconic Drawbars of his Electronic Organ. This concept allowed one or more keyboards to control the pitches of many pipes within one set or “rank” of pipes. Adopting the harmonic standards and nomenclature of the Pipe Organ, Mr. Hammond’s design assured that any organist would be able to play his instrument without a steep learning curve. Unlike the Pipe Organ, Mr Hammond’s design allowed variable volumes of each Harmonic represented by each drawbar. This variation gave the musician millions of combinations of harmonics, and assured that every Hammond player would be able to summon a unique voice. An extra level to the expression a Hammond Organist had at their fingertips was added because the Drawbars could be manipulated in real time. The Sk Series features real drawbars in the size, shape and configuration of Vintage Hammonds. 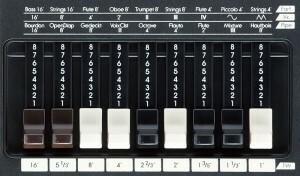 The Drawbars also serve the Combo and Pipe Organ divisions, but with a slightly different function. One of the most distinctive parts of the Hammond sound is the shimmering “Chorus Vibrato”. It adds a silken quality to the sound by adding a second, slightly detuned pitch to the original in the Chorus Mode, and repeat-modulating the pitch slightly in Vibrato mode. Mr. Hammond’s original design used an electromechanical apparatus that looked much like the distributors you would find in the automobiles of the day, and ran off the same synchronous motor that powered the Tonewheel Generator. The Sk’s Chorus-Vibrato is executed in the Digital Realm, without moving parts, and works under the same model. 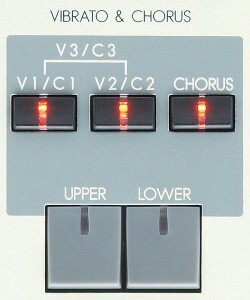 The classic V1/V2/V3/C1/C2/C3 controls are familiar to anyone who has ever played a Hammond. As with the Tonewheel Generator, Digital control allows a wide range of adjustment that was simply not possible on the original. As the Antique organs aged, the components acquired their own unique qualities. Digital control allows the user to shape the Chorus/Vibrato’s various facets, with the added ability to “age” the effect-with the resulting treble emphasis and subtle distortion that marks the organs that develop this patina as “sweeter” than others. The new “Mix” control allows you to temper or boost the Chorus/Vibrato creating the sound of a Vintage Hammond whose Chorus/Vibrato has dimmed with extensive use, or has grown overly intense through the years. These adjustments are saved per preset. The chief feature of the Hammond B-3 upon its release in 1955 was the inclusion of Touch-Response Percussion™ (Perc). This effect added a high “attack” to the Organ tone at either the octave or the twelfth, with a fast note decay. This sound was reminiscent of an xylophone or clave, and became immensely popular, immediately. Perc gave the Organ a bright highlight, and every generation of music has embraced this sound. Controls for the Perc have the classic nomenclature, familiar to anyone who has ever played a Hammond. On the Sk series, Perc is executed in the Digital realm, allowing a wide range of controls the organists back in the day did not possess. The 1′ drawbar muting, characteristic of the Vintage Organs can be defeated, as can the drop in Drawbar volume level that accompanied the engaging of the Percussion voice. You can control the volumes and decay times as well. In order that every key (and pedal) of Laurens Hammond’s Organ could access every Tonewheel as predicated by the Drawbar settings, an electro-mechanical apparatus lurked behind the keyboards, with 9 contacts corresponding to each drawbar for that keyboard and a series of contacts attached to each key. As a key was depressed, the contacts sequentially touched, and the circuits were completed to produce the Organ tone registered by the Drawbars. The very nature of Electric circuitry dictated a click could be heard at the top of each note played when the current-carrying key contacts touched. Laurens Hammond considered that click to be a nuisance, and worked to no avail in order to rid his organ of that imperfection. The jazz players who embraced the Hammond Organ, however, found the click to be a percussive highlight, and wanted nothing to do with its eradication. To make matters worse, as the Vintage Hammonds aged, the click became more pronounced, and by the Rock and Roll era, Key Click assumed a role of importance that Laurens Hammond could never imagine. The Sk series allows you to adjust the intensity of the key ON click, and the key OFF click. The timbre of the click may also be adjusted. Mr. Hammond would have greatly approved of the Sk, as you can turn the click all the way off if you desire, creating a Vintage Hammond Organ that could not exist in the physical world. The inclusion of this obscure feature demonstrates the commitment to authenticity Hammond has brought to the Sk Series. Inside the Vintage Hammond B-3, on one side of the tube preamp, there was a “Screwdriver Pot” with the engraved legend “Tone”. It was introduced as a part of Mr. Hammond’s crusade to temper “key click”, but this was never made clear to the public. The “company line” was this control was to be adjusted by the Technician installing the organ in order to tame the treble response in the instance of the organ’s installation in a Church or Mortuary, where a more “muted” organ was desired. The control was a cocktail of upper Mid and High frequencies (the proportions of which were, until recently, held secret.) The “Tone” control was basically a “hi cut” control and only went “down”. That this control’s presence and location were obscured goes a long way in explaining why there was such a variation in sound among Hammonds. Further, You could not direct the control to go “up” for “boost”. The TONE control is included in the Sk’s menu with the added benefit of being able to BOOST the unique blend of frequencies, which adds a nice “edge” to the Sk tone, if desired. At the dawn of the Rock and Roll age, many groups could not carry the 500 pound Hammond Console Organ and 450 pound Leslie Speaker. The advent of transistor electronics brought forth smaller, more affordable portable Organs. The Thomas Organ Company in the U.S. and Italy’s Farfisa were at the vanguard of their design, and the Rock and Roll community embraced their instruments fervently. Thomas sold their Combo organs under the Vox name and their premier offerings were the “Continental” and the budget priced “Jaguar”. Farfisa’s organs became Rock icons, and the marque reached its height with its “Professional” model. The sound of the transistor Combo Organ never went out of style, and has even flourished in the “Indy” scene of the 21 st Century. The sounds of all three classic instruments are faithfully reproduced in the Sk series, with the ability to register them in the exact way you were able to on the originals. 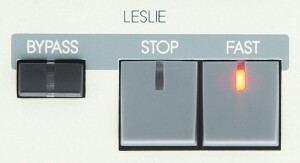 All three models employed a variation of Hammond’s Drawbars, and an accompanying legend on the control panel marks the functions for each drawbar, for each model. The compact Sk series has a mammoth heart, with the inclusion of 32 Digital Ranks of Classical (Church) Pipe Organ derived from our Flagship 935 Church Organ. The Pipe Organ division uses the Drawbars as Drawknobs to select the stops you choose. Now you can take this majestic sound wherever you desire, whether it is to accompany Worship, Perform Classical Organ Literature, or Practice with Headphones in your Dormitory Room. Progressive Rock groups have relied on the sounds of Classical Pipe Organs, and have had to compromise with the few inflexible samples contained in Synthesizers and Samplers, but now the sky is the limit with a Classical Pipe Organ that can be registered in the traditional manner. As is customary with Hammond, each rank of pipes may be voiced independently to the user’s specification, and stored for instant recall. The Drawbar and Combo Organ Divisions have a number of effects that may be applied. 4 different types of Overdrive, Phase, Flange, Chorus (Stomp Pedal Style-separate from Hammond Chorus), Auto Pan, Ring Modulator, Wah-Wah, Delay and Tremolo. A 3-band EQ is available with Shelf Lo and Hi with sweepable Mid control. Hammond’s exclusive Prochord feature is added to a number of sounds, on the Sk series. With it, you play a chord on lower keyboard (with the keyboard split function engaged on the Sk1/Sk1-73/Sk1-88, and on the actual lower keyboard of the Sk2) and by playing a single note on the upper keyboard, you will hear complex harmonic voicings based on the chord that you are playing. With this feature, you can instantly produce a foolproof, professional sounding “horn section”, or other unique arrangements. This is not an “auto play” feature you might find on non-pro instruments, but a powerful tool that can add great color to your playing. The instances of Prochord in conjuction with the Symphonic Strings Library voices add another component, that of leading voices in perfect enharmonic form. This allows you to create a rich, orchestral score “on the fly”, playing one finger with playing chords on the lower manual. Even at Hammond, we realize that Musicians don’t live on Organ alone. There is a set of keyboard sounds that is basic to every genre of music, centered mostly on the Piano, acoustic and electric. Our goal in designing the Sk series was to create a foundation instrument providing the basic building blocks of a comprehensive keyboard rig, and that meant a serious Piano voice. Our engineers meticulously developed the Sk’s Acoustic Grand Piano with the target being the Yamaha C7 Grand, perhaps the most widely admired Acoustic Piano in the World. It was engineered to respond to every nuance a player could ask of it, through all styles of music. It also had to have a comfortable playing feel in sight of the Sk’s Waterfall Keyboard which is a hallmark of Hammond Organs, and make an instant transition between “Organ Feel” and “Piano Feel” should the player make such a program change. One touch of the keyboard confirms and verifies the research and development that went into it. It’s one of the best sounding and playing Pianos anywhere-with a genuine Hammond Organ a switch press away. After the Acoustic Grand, the next essentials are a pair of instruments that also have found their way into most every corner of music, the Rhodes and Wurlitzer Electric Pianos. These electromechanical instruments are great as rhythm voices, but are equally hot in the solo spotlight. Especially adaptable for many DSP effects, these two voices are tonal chameleons. If you can’t find something to play in a song, chances are a Rhodes or Wurlitzer will fill the void. The Sk features two variations of the Rhodes voice recalling their “Stage” and “Suitcase” models. Your playing velocity will reveal the depth of Hammond’s engineering, as greater velocity will call the various “artifacts” and noises that come with this electromechanical instrument. The Wurlitzer Electric Piano used vibrating metal “reeds” in place of the “tines” used by the Rhodes. The Wurlitzer was lighter in weight and sound than the Rhodes, but only until the Amps were cranked up, then the Wurlitzer became a rock/funk/blues beast. All flavors of the Wurlitzer are available in the SK series. It is difficult now to think of a time when Digital Pianos were not widespread, but it wasn’t long ago if you wanted the sound of a Piano, you either had to move one (insanity for a small band), or hope the venue had one (and it was well enough in tune…). In the late 70’s and 80’s, Yamaha came to the rescue with their ubiquitous CP-70 Electric Grand. Not quite a “real” Piano, but close enough; it became an iconic sound in and of itself. The Sk has captured this sound perfectly for your use. Hohner’s Clavinet was essentially a solid body guitar played with a keyboard. It was a European curiosity for many years until artists like Stevie Wonder and Billy Preston got hold of it and made keyboard history. Funk, R&B and Disco were practically defined by its sound, most often heard with Phaser or AutoWah, usually both. Nearly every modern keyboard has a “Clav” stop, but few offer all the pickup positions and the wide range of sounds they cover. The Sk has all the combinations along with a CryBaby Wah model that morphs any volume pedal attached into a Wah Pedal. The Harpsichord may not be a first call Rock and Roll or Jazz instrument, but is an important part of many other genres. Like most of the Keyboards contained in the Sk, you are able to register the Sk’s Harpsichord traditionally, with a Lute stop available. You can hook up an external MIDI keyboard to the Sk, such as a weighted 88 note controller, assigning all the Pianos, etc., to that keyboard and maintain the Sk’s keyboard as a dedicated Organ. This gives you a full keyboard rig that is very mobile, yet complete. Like the Hammond Organ, the Accordion is an instrument found in many genres, with few modern keyboards accurately delivering the voice. The Sk features the entire range of a Suzuki 120 Accordion, with spot-on accurate and authentic registration capability. The unique symbols for Accordion registration appear in the display window, and a Musette setting is available as well. The Sk is designed to be a comprehensive foundation keyboard, providing the “meat and potatoes” for any performance, but Hammond adds a selection of Orchestral and Synth Instruments for added versatility. Trumpet, Trombone, both also with Mute, Flute, Alto, Tenor and Baritone Sax are offered in solo and ensemble voicings. Glockenspiel and Vibraphone voices are also on the menu. A selection of String Synth and Traditional Synth voices are available on the Sk. Like all of the Sk’s Extravoices, they may be played solo or in combination with any of the Drawbar, Pipe or Combo Organ tones. The Sk’s voice capability will continue to grow, at no extra cost to you. Library voices may be downloaded from the Hammond Website free of charge, and easily installed in your Sk. New voices will regularly be added to the website. Please refer to the Library section of this website for the list of Library voices available. 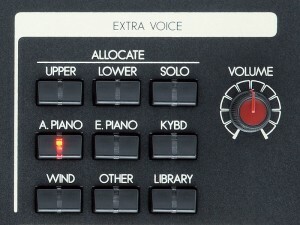 The Extravoice division has a DSP independent from the Organ division. 4 different types of Overdrive, Phase, Flange, Chorus, Auto Pan, Ring Modulator, Wah-Wah, Delay and Tremolo. A 3-band EQ is available with Shelf Lo and Hi with sweepable Mid control. The Sk series has 100 Factory ROM Presets and 100 User-adjustable Presets. A Manual button on the control panel renders the entire control panel current. The ten buttons in the center of the control panel are assignable to any of the 200 presets for instant recall of your favorites. The same panel may be switched to a numeric input pad for direct selection of presets. The entire Sk setup may be saved to a common USB “Thumb Drive” for backup or restoration. Up to three external MIDI zones may be controlled by the Sk, with all settings saved as a preset. You can play these external zones with or without the Sk voices sounding. 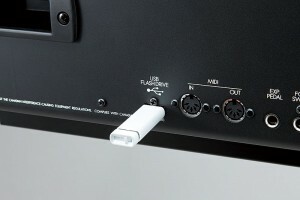 The Sk has an onboard Music Player that reads Mp3 or .WAV files stored on an attached USB “Thumb Drive”, and plays the audio signal along with the SK’s output through the Stereo ¼” outputs. 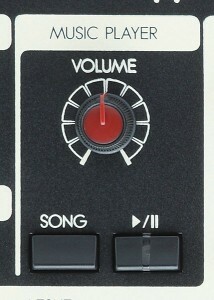 A discrete volume control for the player and start/pause controls are located next to the Master Volume control. There is a system-wide reverb available, also a system-wide Equalizer. 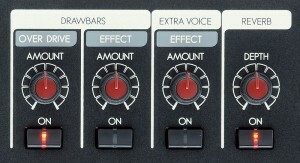 The Reverb parameters are saved within each preset, but the system-wide EQ is independent of the Presets, its settings remain unchanged regardless of Preset choice. System Upgrades are issued through this Website, and are installed via a USB “Thumb Drive”.